Have you ever thought about what your kitchen looks like to your children? It’s actually kind of a scary spot. Full of hard edges, spaces that burn, countertops that they can’t see. Part of teaching your kids to cook is to make this space a little less scary. We spend much of our time teaching our children to brush their teach, do their homework, and even some basic household chores. How much time have you given to introducing your children to the kitchen? Until recently, I was completely guilty of hurrying through food prep and not including my kids. It was just going to take longer and who wants that? What I realized was I was raising children without basic cooking skills and I needed to turn that around. 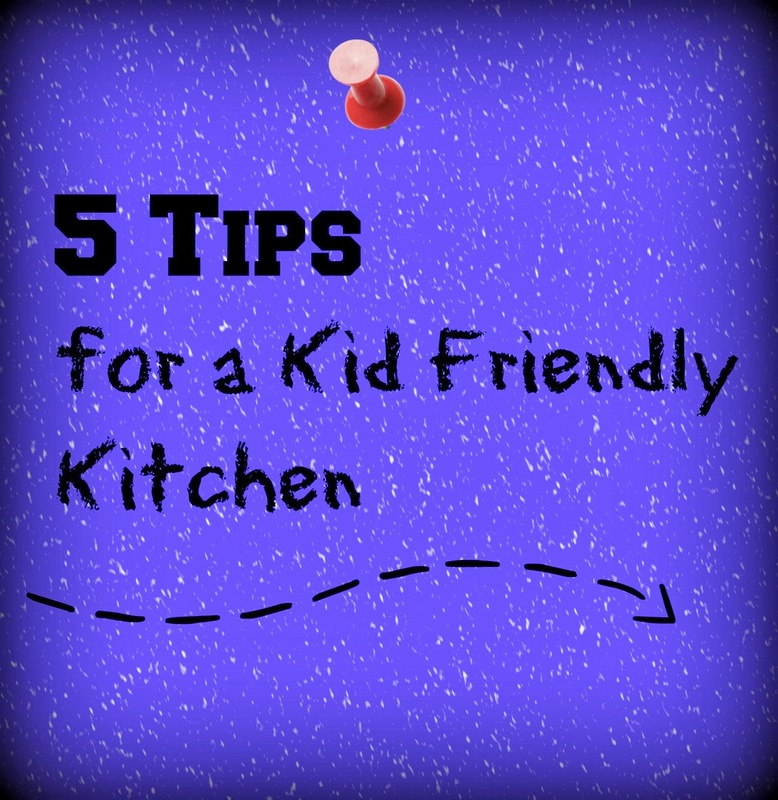 Here are 5 super easy tips to create a more kid friendly kitchen. Take your kids on a tour of the kitchen. Really show your kids around the kitchen. Let them know where you keep the toaster. Show them where the butter is in the refrigerator. Go through the pantry and talk about why you have items stored the way you do. Re-think your space. Do you expect your kids to make their own lunch, but have all of the items they need up high where they can’t reach them? Instead think about creating a lunch-making station in a lower cupboard. I like to keep a few mixing bowls down low that the kids can get out on their own when it’s time for us to cook together. Consider labeling drawers and cupboards. I’ve seen this done when teaching children to put their clothes away in their drawers. Why not use this same idea in the kitchen? I’m not suggesting you mess up the look of your kitchen forever, but it is fun to label and then make a game of it for a day or weekend. Hang out in the kitchen with the kids and say something like, “Who can find the honey first?” “Where is a frying pan?” Your kids won’t think of the kitchen as being scary if they have fun with it. Show the kids how to wash dishes. Kids love to play in the water. Set them up at the sink and let them play in the water. It’s OK if they really don’t get the dishes too clean the first time. They are learning. My little ones love to do dishes. They can scrub the same bowl for an hour. Talk about clean! Show older children how to use the “power tools”. This can be so much fun. 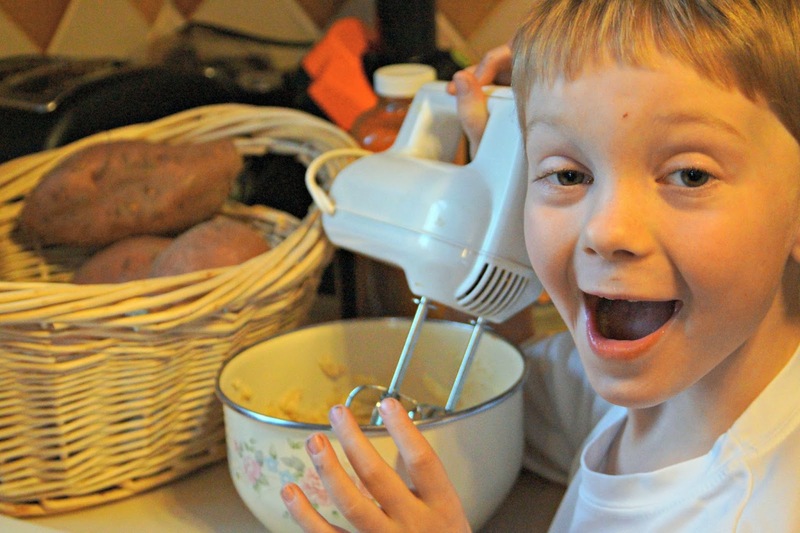 Show your children how to use the hand mixer, food processor, and even the toaster. They get such a kick out of being able to use these items. Make sure you supervise the whole time. We don’t want them getting hurt. Go over the steps you take to avoid cutting and burning yourself. Teach them to watch out for long hair. They aren’t born knowing this stuff, so let’s teach them. Parents have a huge influence on their children. Let’s use that to teach them to really enjoy their time in the kitchen. Listen to music, laugh, and really enjoy your time together. Not only is this the quality time we parents all crave with our children, but it also a time to teach your children a lifelong love of cooking. What are some of the ways that you have taken the scary out of the kitchen? What have you done to prepare your kitchen to be more kid friendly? What organization tricks have you found to be a help to both you and your children? Great ideas for the kitchen. I love when people cook together and include the whole family no matter what the age. All my kids are now teens and it is so much fun to cook with them. We have been cooking together since most of them could even walk. My goal as a mom was to teach my children how to cook before they leave home. I truly believe it is important. Thanks for this great post. Another helpful hint is to make sure everyone puts everything back where it belongs as soon as they finish with it. Diane it sounds like you gave your children a wonderful childhood and really taught them skills to be great cooks on their own. That is really great. Sounds like we are very like – minded on the importance of teaching our children to cook. Put everything back……..that is excellent! How is the next one to find it, if it is not put back? Another great idea that I've heard of is setting up a kitchen play area for little ones. Some plastic bowls and spoons can be great fun for your little one while you are cooking. Before you know it he will be big. Enjoy the little years. It can really be fun sharing the kitchen with little ones as long as you bring along plenty of patience. These are great tips! I've already started purchasing "adult" items for the kitchen and leaving the older ones to the kids so that we can cook together. My son will be cooking once a week when we move and I want my daughter to start learning too! That is a great plan April! Having the kids cook once a week will give you all something to look forward to each week. Excellent tips! The knives are what make me nervous. My oldest took a cooking class and actually learned how to use knives properly, but out of my three kids, he's the one that cooks the least. My grandson comes over 1 weekend a month and he loves to help in the kitchen. He is only 4 years old so his "help" is always an adventure. Thanks for the great tips. I will be putting a few of these into practice the next time he comes. Great tips! I always kept the plastic things in the lower cabinets – even the large mixing bowls I use every day. Even the smallest ones could get to sippy cups and snack bowls much easier and it was one of the first things they could help put away after unloading the dishwasher. Nearly all of mine are boys and they really love using the "power tools". Now that they are bigger, they can really get some work done in the kitchen.